Bob Barrows stopped by my place this week in new Bearhawk LSA on his way to Austin, TX to join Mark Goldberg on a trip to the Bearhawk Kit Factory in Mexico. Bob and Mark are going down to spend a week checking on the progress of the new LSA Quick Build Kits to make sure they conform to the plans completely and getting Bob’s approval of what the factory has done. Bob ended up staying with me for a couple of days during which time I had the chance to take the LSA for a couple of flights. As most of you know, I previously built and flew a Van’s RV-6A, then a 4-place Bearhawk from scratch, and am now finishing up my Patrol from a kit. I also flew Mark Goldberg’s Patrol from Austin, TX to Oshkosh, WI and back for Airventure this year and had a blast. The Bearhawk LSA sure drew a lot of attention at the small grass strip airport (Shadetree MS-82) just north of Gulfport, MS where I live. The locals at this airport have a wide range of airplanes. We have several Vans RV series (3, 4 8 and 12), a Luscome, a couple of Stearmans, an AT-6, a Piper Cub, Beachcraft, several C-172’s, etc. Let’s just say we have a wide variety of airplanes and pilots. For both of the days that Bob was here, we never had a time when there wasn’t at least 3 or 4 people gathered around looking the LSA over and asking Bob endless questions. Bob was in heaven answering questions, looking other airplanes on the field and asking the owners of those airplanes about their airplanes. Of course this visit gave me the opportunity to spend some serious quality time with Bob and the Bearhawk LSA. The engine in Bob’s LSA is the same model that’s in our local Cub airplane (Continental C85) so I am already familiar with the performance of the engine. In the Cub, it seems a bit anemic so I am wondering how well it will work in Bob’s LSA. As most folks know, I am building a Patrol from a kit. Since my Patrol and Bob’s LSA were both in the same hangar, side-by-side, I was able to compare the LSA to my own Patrol which is complete minus the wings. To me the two airplane’s cockpits look identical in size. The LSA is actually 1” narrower in overall width and about 12” shorter in the baggage compartment. Sitting in the Patrol and then the LSA, I really couldn’t feel a difference. I was surprised when Bob told me to go ahead and take the airplane up alone. He said, “Well, you have been flying your Bearhawk and Mark’s Patrol, this is even easier to land than both of those airplanes, so you shouldn’t have any trouble at all”. With that advice I closed the windows and taxied out to the runway. Wind was about nice at about 5 to 8 knots pretty much right down the runway. After a run-up, I lined up at the end of our 2800 foot grass runway and got ready to add power. Now before I continue this story, I wanted give you my before flight expectations. I figured it this way. This has basically the same engine as the Cub that I had been flying but has been beefed up a little (it makes about 100 hp) and probably has a better prop. This is a Bob Barrows design, so I can expect a bit better performance that the Cub. The runway is a bit uphill so the cub usually takes about 500’ to 600’ to start getting airborne, we are usually just about level with the 50 trees at the half-way point of the runway and at about 500 ft agl by the end of the runway. By the time I turn downwind in the Cub it’s usually just about at pattern altitude of 800‘ agl. So with an expectation of a little better performance that the Cub, I pushed the throttle forward and and as expected didn’t have to add very much right rudder to keep it straight. In fact I really didn’t have the time to even think about the rudder that much because it was already lifting off the ground in something a little less than 200 feet. I quickly glanced at the airspeed indicator and saw that it said 75 climbing toward 80 mph, so I pulled back on the stick to get it down to the recommended 60 mph climb-out speed that Bob had given me. The deck angle to achieve a 60 mph climb was a bit steep but I hung in there with it. The airplane climbed straight up that steep line and had me at 1000’ agl before I was at the end of the runway. Although Bob doesn’t have a VSI, my best guess would put the climb at about 1500 to 1800 fpm. Unbelievable for a 100 hp engine with a big guy like me on board! For the first few minutes I just spent some time getting a feel for the airplane, doing left and right turns. I had leveled off at about 1500 feet and pulled the throttle back to 2400 rpm. Bob has a non-sensitive Altimeter and no VSI so it’s kind of hard to tell if you are climbing. I put the nose about 4” below the horizon and held it there as I cruised along and did shallow turns. The next time I looked at the altimeter I was approaching 3000’ so I knew I was still climbing. I trimmed it with a lot more nose down to where I could swear I was in a decent, but that ended up being straight and level, with the nose significantly below the horizon. Cruise at 3000’ at about 60% power was showing 110 mph IAS (about 116 TAS). I spent some time doing some steep turns both left and right. The aircraft rolls into and out of the turns briskly and needs just a touch of rudder just as you roll into and out of the turn to keep the ball centered. I wasn’t used to the low nose angle so I kept climbing during the steep turns. After a while I got used to the low nose angle was able to maintain the same altitude through the 360 degrees as evidenced by passing through my own wake upon completion of each 360 degrees of turn. I then slowed it down and did a few stalls. Pulling the engine to idle and keeping the nose on the horizon, the airplane stalled right at 30 to 31 mph IAS. The stall was very gentle, wings level and the nose dipped below the horizon. Release of back pressure on the stick and the airplane was immediately flying again. No tendency to drop a wing and no scary behavior was noted. Slow fight at about 40 was tried next. The controls were effective and no mushiness could be felt. The airplane was fully controllable all the way down to the stall. I don’t remember feeling any pre-stall warning or buffeting, but I didn’t spend much time exploring stalls; maybe next time. Overall, I found the control forces for the ailerons and rudder to be very balanced. The control forces are lighter than the Cub and the roll rate is much faster, especially if you put in a little rudder when starting the turn. Small movements of the stick are all that’s required to make the airplane do whatever you want. The elevator and rudder do not seem to lose their effectiveness at slow speeds all the way down to the stall. I guess that’s part of why it is so easy to land. Later, while I was doing landings, I noticed that it just seems to do exactly what you want it to. The pitch is very precise and there is no wallowing around or running out of elevator in the flare. It does precisely what you want it to. No more and no less. I then headed back to the airport to try some landings. I entered a downwind at 800 ft alg and slowed to 90 mph. when I was abeam the touchdown point of the runway, I pulled it back to idle and held the nose up until it got it down to 50 mph and then I trimmed it all the way back as far as I could. I ran out of trim and had to hold a little back pressure to maintain 50 mph. (Bob said he is making adjustments to the trim system as it does run out of nose up trim with one person flying). On my first landing, I made the downwind to base turn too soon and ended up quite a bit too high (this airplane glides really well). As I turned from base to final, I was already thinking about a go-around (which sucked because Bob and 4 other airport guys were watching), but decided to slow to 45 mph and do a full slip. As I entered the slip, I felt the nose want to drop but added more back pressure and held 45 mph with full right rudder and left wing down enough to finish the turn to final and then to keep aligned with the runway. Down it came, better than I expected and I ended up being only slightly high by the time I neared the runway threshold. At about 10 feet agl, I released the full rudder input and the nose came around pretty-as-you-please and it was almost time to start the flare. One thing I noticed immediately was that it was very easy to judge my height above the runway. I brought it down to within about 6” and just held it off as it slowed (it was so slow at touchdown, I almost felt like I could just get out and walk alongside) until finally it settle into the prettiest 3-point greaser you ever saw. I liked that one so much; I back taxied on the runway and tried it again. This time as I lined up with the runway, I held the stick back full and held the brakes and gave it full power before releasing the brakes. Once it started rolling I went to neutral stick and off she went shorter than the last time. This time I was already expecting the steep climb angle to achieve 60 mph so I held it there and I was at pattern altitude by about the 2/3rd point of the runway and went ahead and made my crosswind turn. This time I expanded my downwind just a bit more before turning base, but even with that, I was still was a little high on final (did I already say this airplane can glide?) A little slip was needed, but not nearly as much as last time. I came down final at 45 again. This time I flared a bit late and the aircrafts momentum carried me into the ground – I touched down in the 3-point attitude but landed a bit harder. I really thought it was going to bounce like my Bearhawk always did when I messed up and landed that way, but no, it just planted and stayed right there. I hit the brakes and was stopped within 200 feet of my touchdown point. Bob needed to fix a small oil leak in the engine’s oil sump, so we spent the afternoon removing it, cleaning welding the crack and putting it back together. When it was all done, he said well, I guess we should test fly it to make sure the leak is fixed. I felt like a little kid jumping up and down with my hand raised saying “I want to do it, I want to do it”. Bob just smiled and said “Go for it”. After I returned from that flight, my wife Michelle called and asked if she could get a ride in it. I asked Bob and he said “sure, tell her to come on”. By then the wind had picked up and was getting a bit (only about 10 to 12 knots) and was getting a little bit squirrely varying from 45 degrees to the runway heading. Bob asked me if I wanted to take her up or do I want him to because of the winds. I said, I would if he trusted me to do it, and he said “go for it”. So Michelle climbed aboard. So now we are nearing 400 lbs. of people about 100 lbs of fuel putting the LSA just under the 1320 lbs. gross limit for LSA’s. I was very surprised when I could feel no appreciable difference in the takeoff or climb performance. Michelle later told me that it felt like an elevator ride because we were climbing so fast. Of course have a 10 knot headwind, quartering at 45 degrees help a lot. In summary, this airplane doesn’t in any way feel, look or perform like one would expect a Light-Sport Aircraft to do. It feels every bit as solid as my Patrol or Bearhawk, the performance is outstanding and it is super easy to land. Bob said that on this trip he cruised at about 110 mph all the way here from Virginia and averaged 4 gallons per hour. That’s better than 25 mpg. How many vehicles do you know that can travel at 110 mph getting 25 mpg. Heck my truck burns 19 mpg at 65 mph. 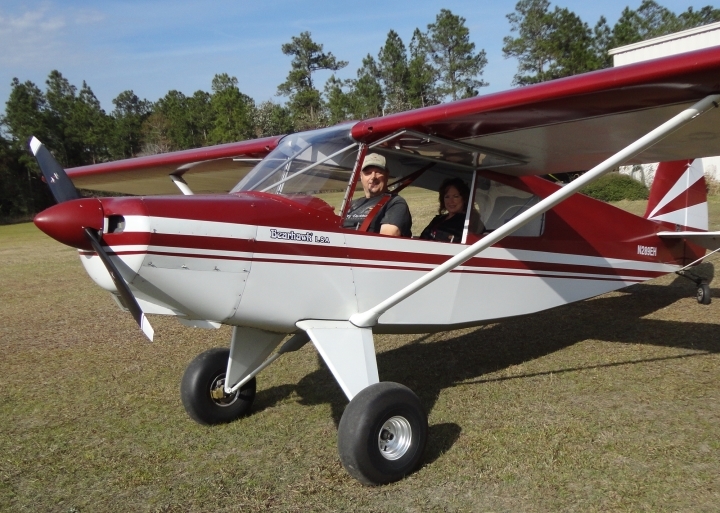 Bob said a couple of the local airport guys were already talking about buying plans, so I might have a Bearhawk LSA at my airport in the future. I certainly hope so; it was a blast to fly!